Looking down at the plain that lies between the base of the Preseli Mountains and the beaches of North Pembrokeshire, it’s a job to cast about for a description without the worn out comparison with a patch-work quilt shouldering its way through the alternatives. Some clichés exist for a reason however, and in lieu of a more convincing simile, this one will have to do. Sprinkled, punctuated, peppered and dotted are also words which recommend themselves unbidden, and also un-bested. So. . . The land is sprinkled with sheep, punctuated with springs and rocky outcrops, peppered with farms and settlements, and, most relevantly, dotted with Neolithic monuments. A glance at an OS map reveals another human layer to this landscape, hidden from the unaided eye; an intriguing mixture of place-names, indicating a fusion of cultures, spiced here and there with the occasional Middle-Eastern reference. In this relatively small area we can move from the almost Tolkeinesque (Mynydd Caregog, Ysgarwen) to the pragmatically descriptive (Rosebush, Newport), to the downright unexpected (Babylon and Spite). But for the purposes of this essay, probably the most important features here are the little springs which bubble and run down the Northern face of the Preselis. There are more than fifty of them, each one is nothing more than a rivulet, and for much of the journey downslope they stay that way. But near the bottom of the run they are channelled into two main confluences, separated by less than a mile. Half a mile further on though, and these two minor flows of water have conjoined to form a single body which, although still relatively minor, has managed to carve from solid rock a deep but narrow gorge that runs all the way to the sea at Newport. The environment this amount of water runs through and creates is, unsurprisingly, particularly fertile. The Nevern Valley contains a number of other steep sided gorges whose paths conjoin, mirroring the flow of the rivers that carved them. None are on a monumental scale – instead each one is like a world in miniature – albeit an attenuated and narrow one, brimming with vegetation and wildlife, and never too far upstream from an abundance of marine resources. Mesolithic tools found in the area attest to the fact that ever since sea levels and glaciation have allowed, humans have been exploiting (and enjoying) this area, providing as it does, a wide range of habitats, conveniently arrayed over a comparatively small area. Just North of its first confluence, after countless years of erosion, our river – Brynberian – has exposed an impressive outcrop of rock. Geologists know it as rhyolite, but it may be more familiar to those with an interest in these matters by its colloquial name of bluestone. And though bluestone abounds in the area, it was to this outcrop that Dr. Richard Bevans and Dr. Rob Ixer managed to trace the source of some of the rhyolite present at Stonehenge. This is impressive stuff indeed, but when one pauses to consider the implications of this discovery, it takes on new levels of significance. Because if Bevans and Ixer have managed to zero in so precisely on the source, it also becomes apparent that there is a chance that, at the foot of the outcrop, there could be the remains of a Neolithic quarry. 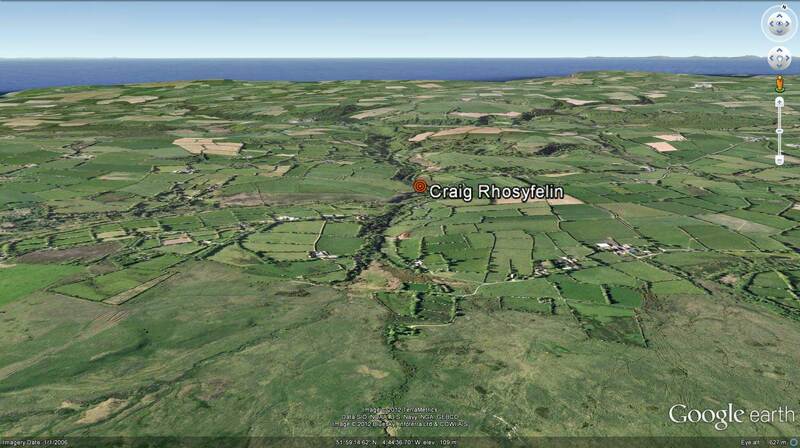 The name of the outcrop is Craig Rhosyfelin which, when translated literally, means the mill on the moor by the rock. The mill was actually half a mile upstream from the outcrop, and survives now only as a footprint in the ground and as a cluster of magnetic transactions on the Historical Monuments of Wales database. 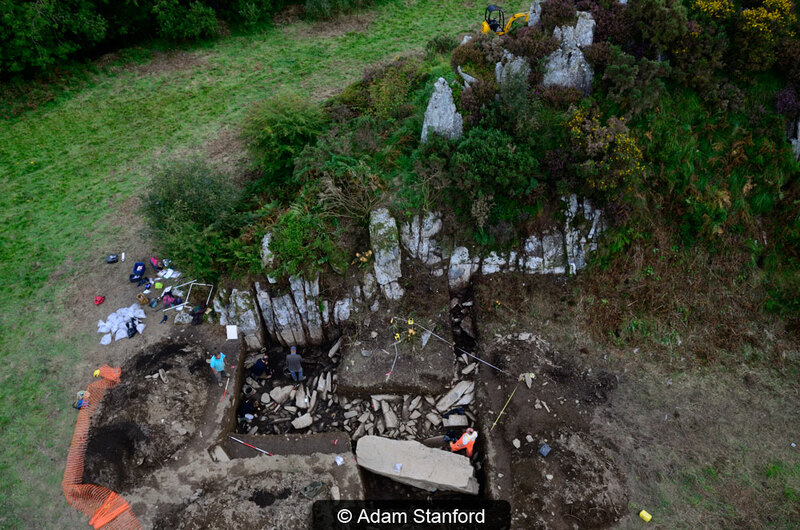 In 2011 a team of archaeologists came here to test the quarry hypothesis. The names of the team leaders will be familiar to anyone who followed the progress of the Stonehenge Riverside Project; they were Mike Parker Pearson, Joshua Pollard, and Colin Richards. 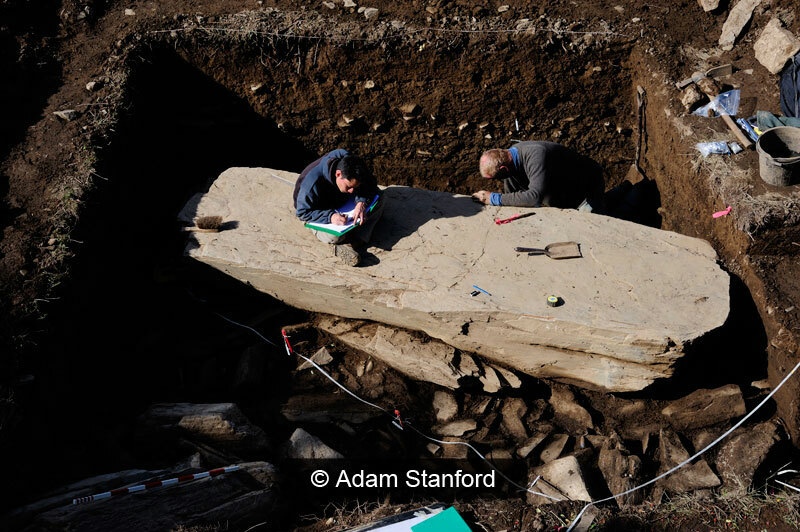 Accompanying them was the archaeologist and photographer Adam Stanford, present in his role as boss of Aerial-Cam, ready to capture images of the excavation as it unfolded. Initially the ground at the base of Craig Rhosyfelin was surveyed using both magnetometry and resistivity. The magnetometry results were, to use Mike Parker Pearson’s phrase, too ‘spotty’ to make head nor tail of. However, the results returned from the resistivity survey were a little more encouraging. One of the features on the printout was an elongated pillar like object a little way from the face of the outcrop. A series of test pits were planned and sunk. The first revealed a build-up of soil – colluvium – which suggested that if there was any archaeology to be found, it stood a good chance of being well preserved below this layer. 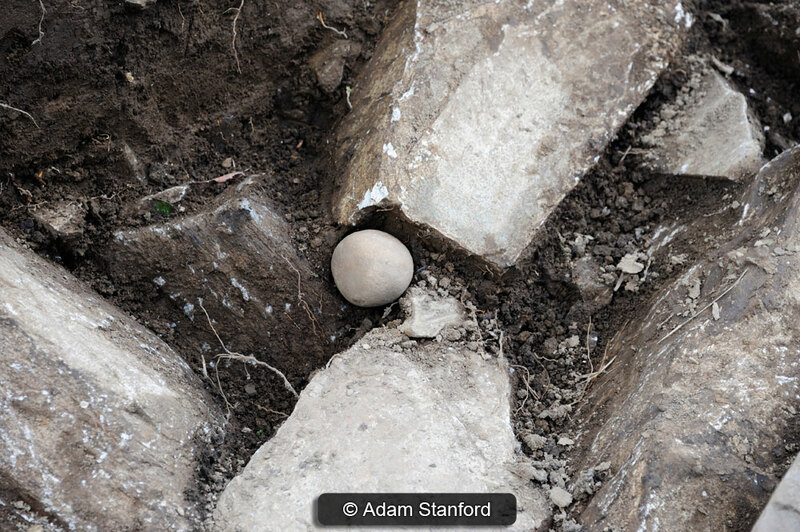 The second pit revealed a tumble of stone which had fallen from the main outcrop – but then a number of tools also came to light – round hammerstones, which abound in the local rivers, and are just the thing for shaping bluestone. The third pit caught the edge of the pillar-like object. The excavation. © Adam Stanford. It didn’t take a great deal of encouragement to extend the pit, and the knowledge that the famer on whose land they were excavating had generously offered the use of his mini-digger if they needed it settled the matter. As the geophysical anomaly was uncovered, the excitement grew. Once laid bare, it became plain that it was a pillar of rhyolite, sheared off from the face of the main outcrop. But it had come to rest in a manner and place that suggested that the sheering off had not occurred naturally. Its position and orientation showed that it had been moved away from the outcrop face, and turned around 90 degrees. Moreover, it had been supported on a series of stone sleepers. It looked, according to Josh Pollard, as if it was ready to be moved out of the quarry – a moment frozen in time. Quite why it was left there is an open matter. Some splitting of the rock had occurred, and the quarrymen may have decided that this particular pillar wouldn’t make the journey. There is also the possibility that a more imaginative motive lay behind the decision – the matter will no doubt be the source of debate for quite some time. The pillar. © Adam Stanford. One thing they could all agree on was that it looked very much as though they had not only discovered a Neolithic quarry floor – a cause for celebration in its own right – but that the quarry was – by extension – connected to the most famous Neolithic site in the world – Stonehenge. What comes next though – if future excavations bear the hypothesis out – has truly game-changing ramifications for how we think about that monument. Just down the river from Craig Rhosyfelin, the gorge is overlooked by an Iron Age hillfort called Castel Mawr (Big Castle – I’m guessing something is lost is translation). At least, up until now, it has always been assumed to be Iron Age. But there are problems with this identification. It’s very large (though this in itself does not bar it from the Iron Age) and the defences are, well, just a little unusual. The ditch is too big, and the entrance seems to have been reduced in size to more common Iron Age proportions. In short, it resembles a significantly earlier style of monument, which has then been substantially modified during the Iron Age. 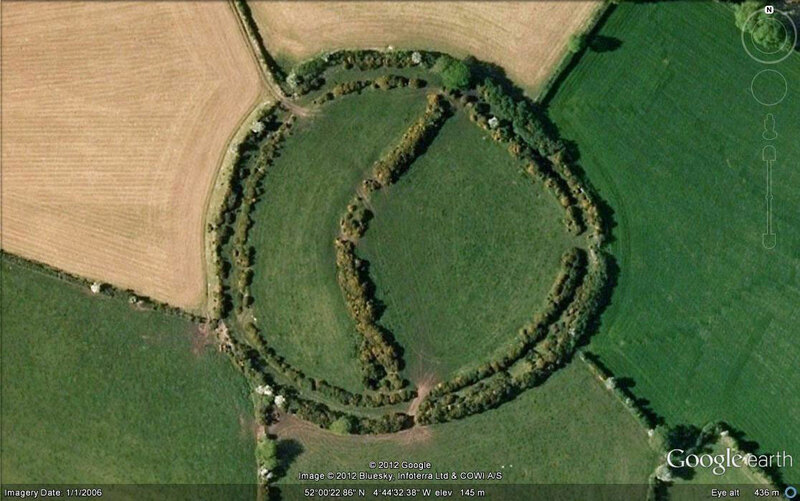 What the unmodified Castel Mawr bears a striking resemblance to is something more akin to one of the larger Wessex henges. And if it does indeed turn out to be a henge, it will be the largest in Wales. It will also pose some interesting questions about who exactly inhabited the Nevern Valley, and how they became so influential in Wessex. If the quarry had been found in isolation we could have stuck with the notion that Wessex men had come here and taken the stone. However the presence of a major henge monument alters the picture somewhat. 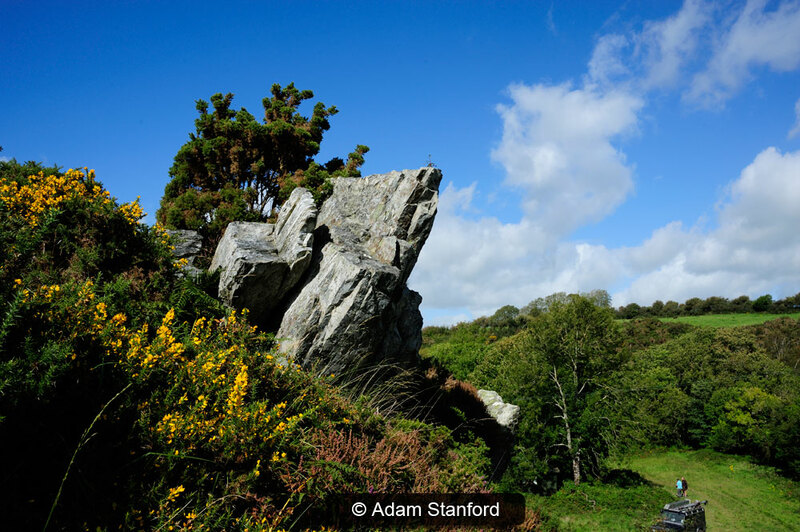 It tips the scales – we need to change the questions we ask about networks and relationships – were the inhabitants of Wessex and the Nevern Valley the same people? And if not, then what was the nature of their relationship? These questions may never be answered fully, but they will certainly be addressed as work on the Stones of Stonehenge Project continues. Follow this blog, or join the Facebook group to keep up with the latest news.